For Crust: In a medium bowl, stir together the flour and sugar. Cut in the butter until the mixture is mealy. Press in the bottom of a 9×13 inch pan. Bake for 20 to 25 minutes in the preheated oven, until crust is light golden brown. For Filling: While the crust is baking, in the same medium bowl, beat the eggs, sugar, flour and baking powder with an electric mixer until light, about 3 minutes. Then stir in the lemon juice. Pour the filling over the crust while it is still warm from the oven. Bake for an additional 25 to 30 minutes until the top is slightly browned. Remove from the oven and cool. 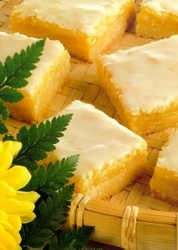 For Icing: In a small bowl, stir lemon juice into the confectioners’ sugar 1 tablespoon at a time until the icing is of a spreadable consistency. Spread evenly over the cooled bars. Cut into squares. Optional: To simplify this recipe, you can skip the icing and just dust the bars with sifted confectioners sugar when cool.